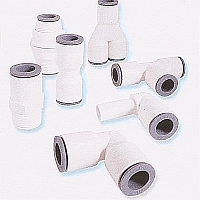 LIQUIfit™ System Push-To-Connect Fittings by Legris Division of Parker offer the most compact profile on the market with EPDM patented sealing technology. 100% bio-based body designed for optimum performance suitable for food and water contact. Tube OD size from ¼" thru ½"